The 142,000 September payroll jobs reported today (2 Oct 2015) by the Bureau of Labor Statistics is too small to be consistent with the still high stock averages or the alleged economic recovery. Moreover, the BLS says that it over-estimated the July and August payroll jobs by 59,000. The average workweek declined to 34.5 hours. The labor force participation rate fell further and is now the lowest in about 40 years. This is especially damning when we remember that in those long ago years many more households could exist as one-earner households. The markets have been hit with yet another negative economic surprise today, this time concerning the indicator that is thought to have the full attention of the representatives of Anglo-Saxon central banking socialism huddling in the Eccles building. The professional soothsayer class has once again failed to foresee this development, but we hereby predict that won’t keep it from continuing to apprise us of the results of its entrails readings. Oh well, at least we will continue to get to make fun of the economic theory challenged “science is prediction” class of econometrists. The ISM Manufacturing PMI was “unexpectedly” weak yet again in September. 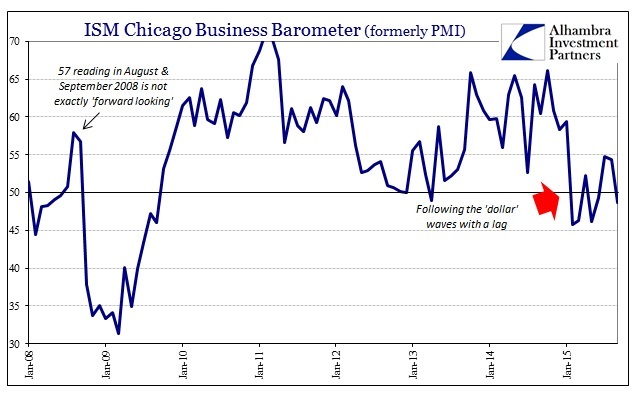 Continuing the theme spelled out by the regional manufacturing surveys (the Fed’s and the Chicago BBI), economic momentum has clearly stalled right where the “dollar” said it would. 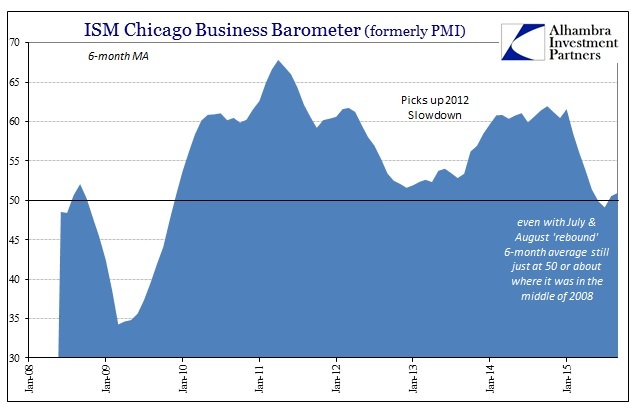 The pattern is blindingly obvious, with a huge slowdown to start the year (coincident to the first “dollar” disruptions including crude oil prices), a pause around May/June (with the “dollar” much quieter after the March FOMC) and then a pickup in August and now more dramatic deceleration in September (after the July start to the latest “run”). At just 50.2, the headline ISM estimate was the lowest since May 2013. New orders fell sharply from 51.7 in August (which was a multi-year low) to just 50.1. While most fixate on the assumed 50 level as an actual dividing line between growth and contraction, these sentiment surveys aren’t nearly that precise and at most offer relative interpretations about the economic direction, trends and the perhaps even the strength of those directions and trends. The last few pieces of data for Q3 more than suggest the US economy faltered in August/September. That trend would be alarming on its own had it occurred in a financial vacuum (as if ceteris paribus actually existed), but following along against the “dollar” is especially so. There was the initial, large decline in early 2015 that “unexpectedly” shocked economists and commentary off their 2014, GDP is 5% perch. That slump was initially met by derision and disembodiment as if it were yet another aberration (continuous anomalies tend to be something other than anomalous) to be discarded in serious analysis. When the “slump” continued on past snowfall and port strikes, it was upgraded to “transitory.” That even appeared to be the reflection of the data as it, again, followed the “dollar” out of the first wave. 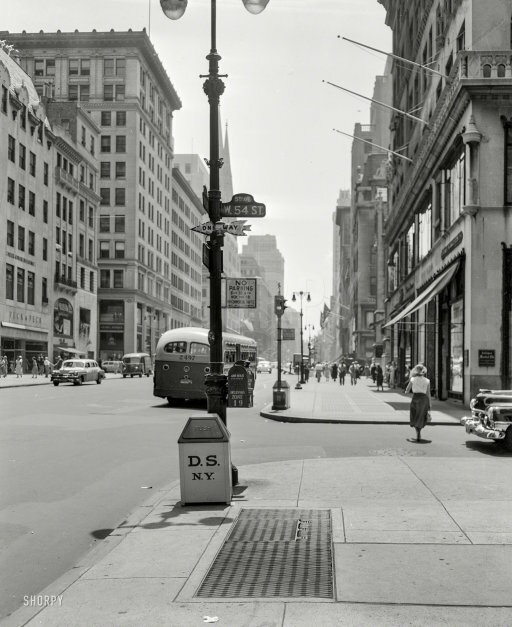 The idea of “transitory”, then, meant expectations (and monetary promises) that there would be no second wave. Obviously, starting around July 6, there was a second hitting everything from oil to China to even the here-to-fore unthinkable denting of stock market certainty. With economic data, especially spending and related manufacturing (since inventory is stuck in between them), now falling again as the “dollar”, all those prior benign interpretations risk undoing if not full repudiation. That is a big risk to markets in terms of prices caught wrong-footed about expectations (reordering assumptions to incorporate “transitory” being not that) but there is also great economic risk as at some point inventory imbalances demand correction. The idea of “transitory” in that context is for manufacturers, wholesalers and retailers (to a more limited extent) to only make slight adjustments to production and trade levels to reflect inventory (and the “dollar”, by extension) but maintaining a positive outlook once the “temporary” problems abate and that 5% GDP comes roaring back as is proclaimed at every juncture. That had already occurred, as production levels have been declining but not sharply so. If business outlooks suddenly shift away from that orthodox tendency, then the inventory problem becomes much, much more than a temporary nuisance; deeper and sharper cuts to production become necessary. A long-awaited meeting between Presidents of Russia and the U.S. will take place tomorrow in New York, apparently, in the room of the Russian delegation in the UN SC. Paul Craig Roberts, professor, Chairman of The Institute for Political Economy, the former Aid of the Financial Minister in the administration of Ronald Reagon, told Vestnik Kavkaza about his view on the Russian-American relations. – Do you believe that the fact that presidents Barak Obama and Vladimir Putin agreed to meet is the sign of thaw in bilateral relations? – No. Of course, not. – What does it mean then? – I think, it means that Putin is too hopeful. It can also mean that he went every possible length to calm down the hostility flowing towards Russia from Washington; but it does not really mean anything, because Putin wants to talk about Syria and ISIS, and Obama wants to talk about the breakaway republics and Ukraine and wants Putin to turn it all back to Kiev. How Can China Blame Exports, Too? 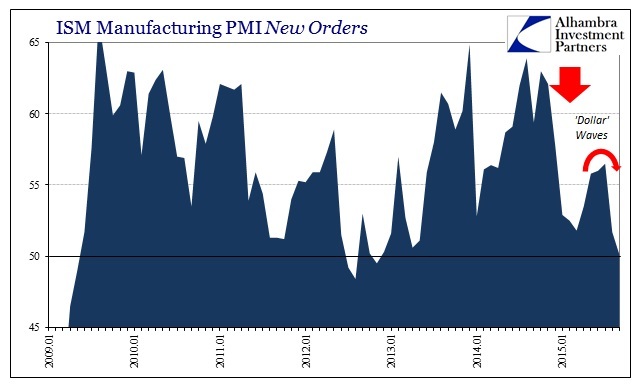 Concurrent to more survey-based indications of a US manufacturing slowdown, economists have been quick to blame overseas problems such that it leaves a “strong” US economy as a baseline. On the other side of that equation, China’s manufacturing likewise is rapidly declining but somehow with the same point of blame. Both Chinese PMI’s were decidedly weak, with the private version far more so than the government’s number. The government’s official gauge of factory activity improved with the manufacturing PMI rising to 49.8, up from August’s three-year low of 49.7 but still marking two straight months of decline. Meanwhile, a private survey by Caixin/Markit revealed PMI fell to a fresh six-and-a-half year low of 47.2, ticking down from August’s reading of 47.3 but still better than an earlier flash estimate of 47. Total new work fell at the quickest rate in over three years, partly driven by a steeper fall in new export business, Markit said in a report. As a result, companies cut output at the sharpest rate in six-and-a-half years, while staff numbers fell at the quickest pace since the start of 2009. 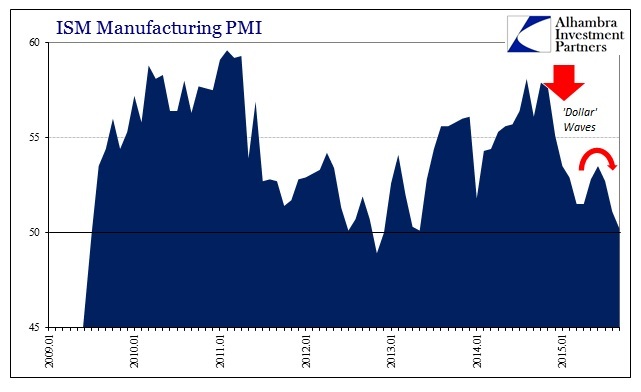 US manufacturing declines on “overseas” weakness while Chinese manufacturing declines on “overseas” weakness as if the two economic systems never deal with each other, only the same, non-specific “global economy” that doesn’t somehow count either of them within its growing malaise? It seems far more likely, beyond a doubt, actually, that with the amount of trade between them (especially from China to the US) if Chinese manufacturing is declining than US “demand” is a problem. A Lehman Moment for Commodities? Where do we begin? With how to add wealth? Or how to lose it? The way to lose it is simple. You buy something that is not worth the money you paid for it. You are instantly poorer, whether you know it or not. DJIA, daily – still unsettled – click to enlarge. If the continuing depression in precious metal prices has a silver lining, it is the enormous surge in demand world-wide for silver. With most mints & brokers experiencing higher than expected demand for silver coins, many are having to set weekly sales quotas after record coin sales. With North American mints overwhelmed by orders, investors and collectors were forced to look overseas for increasingly scarce supplies, triggering a domino effect in Europe and Asia.